This is the first time I've ever reviewed anything by one of Winnipeg's newest breweries, Devil May Care. I've only had their beer once before this and it was at the Stone Angel taproom a few months back. Devil May Care is brewed over at the Stone Angel Brewery, alongside well.. yeah, Stone Angel, as well as Kilter Brewing. All three breweries have gotten rave reviews for their beer since each one of them opening up, to the point that it's sometimes difficult to find any of their beers. 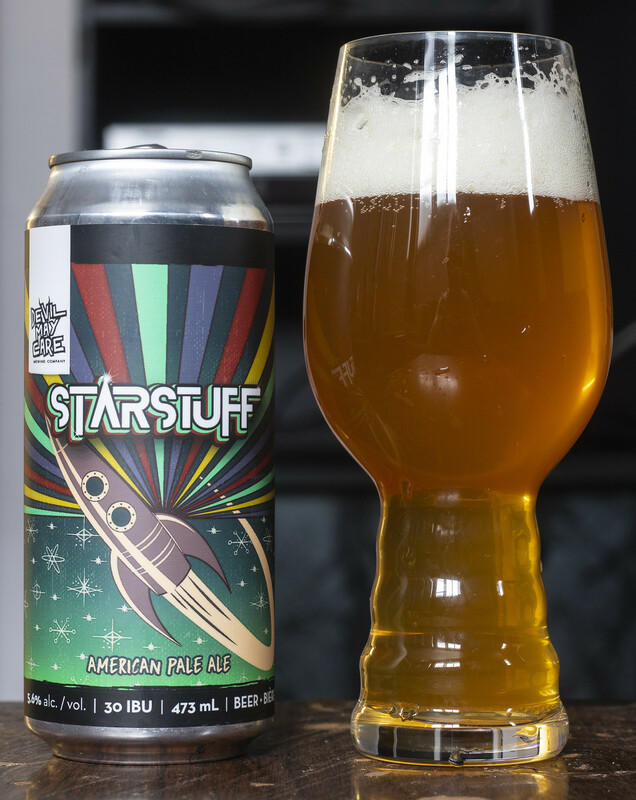 I was able to find a can of Devil May Care's Starstuff American Pale Ale at Quality Inn Beer Store during my last visit to the city. I've said several times before that you shouldn't judge a beer by its label, but sometimes a label just pops out at you so subconsciously you'll want that beer before you know it. The Starstuff label has a serious Futuramaesque theme to it, who doesn't love Futurama? Appearance: Pours a cloudy golden/orange with a light amount of carbonation in the body. The head starts off with a good amount of foam at the beginning (2.5 fingers worth) but pretty quickly diminishes to a thin layer, leaving behind a good amount of lacing on the glass. Aroma: I'm getting notes of tropical fruit - a bit of pineapple, grapefruit, lemon and a bit of orange peel. There's also a light peppery spiciness from the hops popping up, as well as a light amount of breadiness (croissant) to it. Taste: As I was about to take my first sip of the beer, I nearly dropped the glass.. but thankfully didn't! Phew! This is a nice sweet, tropical American Pale Ale. It has notes of pineapple, orange peel, a bit of a grapefruit for bitterness. There's definitely a bitter hop popping up here that I didn't get from the aroma - bitter floral yet kind of piney. Mildly yeasty so it's fairly bready, light amount of caramel sweetness as well. Overall Thoughts: Everything I've had by Devil May Care has been solid so far. So far my favourite of theirs was their Wet Hop Canadian Summer Double IPA, featuring hops from Boissevain's own Prairie Mountain Hops. This one is sweet and mildly tropical but has a nice pleasant hop presence to it. I was expecting it to be more of a NEIPA style just by judging the label, but it turned out to be a nice APA with a tropical presence instead - I do love NEIPAs but I prefer less hazy Pale Ales/IPAs for the most part.